Several people are in the hospital after a crash involving a CT Transit bus and police cruiser at the New Haven Green this morning. Officer Victor Herrera was one of two police officers heading to a fight involving a disturbed person at the train station at the time of the crash, police said. It happened around 10:45 a.m.
Police said both cruisers had sirens blaring as they approached the intersection of Elm and Temple streets and the first cruiser passed through the intersection. Herrera was driving the second cruiser. The airbags deployed and the cruiser was propelled into a concrete post in front of United Church. It was heavily damaged, according to police. Several people are hospitalized after a crash involving a CT Transit bus and police cruiser at the New Haven Green late this morning. Mayor John DeStefano said Herrera was seriously injured but was conscious when he was removed from the car. Herrera was taken to the emergency room and released Monday afternoon. The bus drove over the curb onto the lower New Haven Green and hit a lamppost before stopping. "The whole insides of the bus were falling apart, falling and crashing down, so you had to be careful who was getting their heads hit with things," said passenger Stacey Rogers, of Watertown. "So it was pretty bad. Scary." The bus driver, a woman, and several passengers were taken to local hospitals for evaluations, according to David Lee, the general manager of CT Transit. No one on the bus was seriously injured. 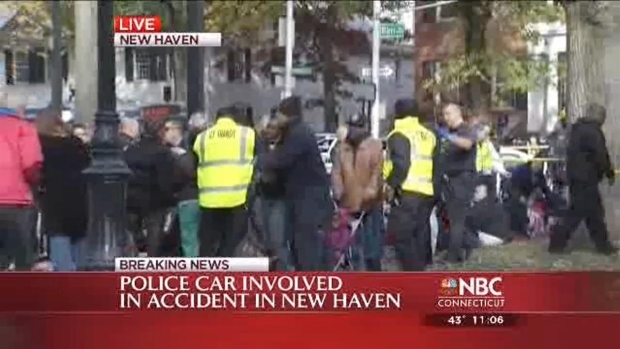 "We believe we've identified everyone whose been hurt here," said New Haven Police Chief Dean Esserman. "Thank goodness, like the mayor said, there were no fatalities." Esserman extended his thanks to the firefighters who freed Herrera from his cruiser at the scene. "We're all extremely grateful that no one was killed, quite honestly, here, or critically injured," DeStefano said. The intersection of Elm and Temple streets is expected to remain closed until around 3 p.m. as the investigation continues. Police are asking drivers to avoid the area until the streets are reopened to traffic. Police expect their investigation to take weeks, if not longer. CT Transit will be conducting an investigation of its own, according to Lee. New Haven police have taken custody of surveillance camera footage from on board the bus. "We have a lot of people down here and we're going to be here for the day, making sure we put this together," Esserman said. "But, again, the priorities are that everybody's safe, thank God."